There are a few jewelry pieces I have been wearing on repeat this summer. I’ve got my gold bangles from The Peach Box, my Lacey Racey Tattoo Choker from Burlap 2 Cashmere, and my dainty little ‘E’ necklace from Ann Revere Jewelry. I definitely switch it up from time to time, but these are the current obsessions, along with my purple Bag Furry that I attach to whatever bag I am wearing that day. I’m sure there are at least a few people laughing at the resurgence of the tattoo choker. I know because I was one of them, mostly because I used to be that kid who wore one every day of my middle school existence. Anyway, they’re back, and I could not be happier! 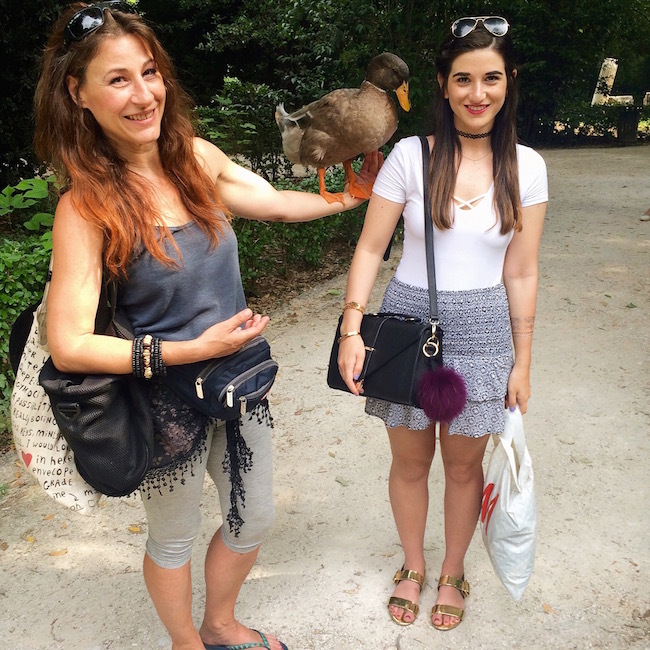 As for the picture with the duck… This was probably one of the greatest days I had in Greece. While my friends and I were wandering around the National Gardens of Athens, I saw this woman out of the corner of my eye. It was a very strange site and I swore my eyes were playing tricks on me, but my friends and I decided to follow her until we got close enough to see that things were exactly as they appeared.